"There's one thing I've heard over and over again here," says Edward Saywell, the top contemporary art curator at the Museum of Fine Arts, Boston, who is showing off works by Ellsworth Kelly, Kara Walker, Cindy Sherman and other contemporary artists in his domain, including many new ones. "They say, 'This can't be Boston,' and I say, 'Yes, it really is.' "
The people in Mr. Saywell's tale are marveling at the museum's new Linde Family Wing for Contemporary Art, an airy 80,000 square-foot space that opened in mid-September, but they may as well be talking about the city as a whole. Boston is known for its wealth of Old Masters, Impressionist paintings and historic American art, not for works by living artists. Since September, the Institute of Contemporary Art has been celebrating its 75th birthday and its fifth year in new home, where attendance has shot up to 200,000 a year from 20,000 in its previous site. "Before we got the new building, Jill used to say we were striving to be marginal," says Barbara Lee, a trustee, referring to the institute's director, Jill Medvedow. Now, the Institute of Contemporary Art is credited with helping to revitalize Boston's waterfront. And under its chief curator, Helen Molesworth, who was hired last year, it is mounting more ambitious exhibitions with prestigious partners like the Tate Modern in London, an important step to gaining influence nationally and internationally. More change is coming. In January, the Isabella Stewart Gardner Museum, a Venetian-style palazzo full of masterpieces from earlier eras, will open a glass-walled building with new gallery space for temporary exhibitions, including contemporary art. The List Visual Arts Center at the Massachusetts Institute of Technology will soon have a new director, Paul Ha, who has been the leader of the Contemporary Art Museum in St. Louis in Missouri. There, he improved his museum's stature and earned a reputation for giving future art stars their first major museum exhibitions. In 2013, the Harvard Art Museums will open bigger and renovated premises with "a significantly expanded program for the exhibition, study, and interpretation of the art of our time," says Deborah Martin Kao, its chief curator. And the Massachusetts College of Art and Design, just one of the area's art schools with a growing student population, is in the midst of an expansion, too. Boston even has something of a budding gallery scene. On the first Friday evenings of every month, people congregate in the South End, where about 15 small galleries and 50 artists' studios stay open late. Camilio Alvarez, the owner of Samson Projects, which shows a mix of local and brand-name artists, says he usually draws about 1,000 people. "There's appetite for more evenings, but we can't handle more," he adds. "There's a ton of interesting things going on in Boston," says Todd Levin, a Manhattan-based art adviser. All these developments are making Boston's contemporary art lovers positively buoyant. "Finally, Boston has the opportunity to develop a critical mass that will attract people," says Steven Corkin, a trustee at the Institute of Contemporary Art who started collecting work by emerging artists in the mid-1980s. Ms. Medvedow dates the origins of this moment to the 1980s, when high-tech companies along Route 128 began to flourish and, she says, "Boston became way cooler." Some newly wealthy residents began to collect just as contemporary art was getting hot and hip. Eventually, says Malcolm A. Rogers, the Museum of Fine Art's director, Boston's collectors became the driving force for more exhibition space for their kind of art. By the late '90s, the Institute of Contemporary Art had embarked on a $50 million capital campaign for a larger, permanent home (it eventually raised $75 million). Shortly thereafter, the Museum of Fine Arts commissioned architects at Foster & Partners to develop a master plan that would include galleries for contemporary art (as well as the Art of the Americas wing that opened last year). The prospect of these new showcases for contemporary art spurred more people to become collectors. Before, says Ms. Lee, "a lot of supporters weren't even collecting, because the I.C.A. was not a collecting institution." Tellingly, the institute had been an itinerant institution, occupying no fewer than a dozen places before settling into its current home. And when, in the early 2000s, the Museum of Fine Arts organized a trip for trustees and patrons to the Art Basel Miami Beach fair, only one or two dozen signed up. Last year, Mr. Saywell said, more than 90 people made the trek. "There are now innumerable collectors of contemporary art in this city," says Barbara Krakow. She ought to know — she founded the Barbara Krakow Gallery in Boston's Back Bay in 1963 and, says Ms. Medvedow, "Barbara Krakow has probably educated more people here on contemporary art than anybody else." She also inhabits the weakest part of Boston's contemporary art culture — hers is Boston's only blue-chip contemporary gallery with an international reputation. Trendier galleries are also few and far between. As Mr. Alvarez notes, people can easily visit all the galleries in the South End in an hour. Back Bay has a few more, and South Boston now offers a half-dozen galleries. But, says Mr. Levin, "it's hard for gallerists to get serious traction in Boston. Collectors want to access the very best work, and that's in New York or Los Angeles or Europe." Bostonians point out that their galleries stack up just fine against those of, say, Dallas or Seattle, which do not face competition a quick plane ride away. "People are just starting to realize that there are good galleries in Boston," says Mr. Corkin. "But they have to have the confidence to buy artists before they have a New York gallery." Ms. Krakow, who said only about 40 percent of her business was with Bostonians, cited another problem with some collectors: "They figure they have to shop in New York — it's an ego thing. They want to say Matthew Marks sold this to me, or I was able to buy from Larry Gagosian, as if they were graced." It may not matter. Mr. Levin says that having a thriving collectors' base in Boston is more important than having a lot of galleries. Also, he says, "they have such a profoundly terrific base to build on in terms of history, and they have the money." 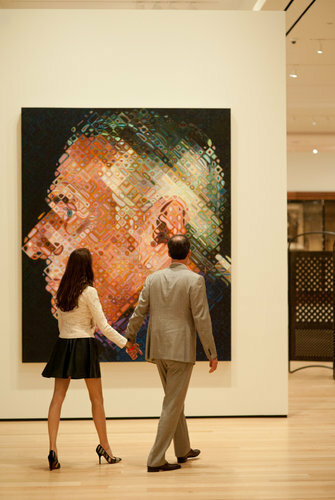 Notably, at both the Museum of Fine Arts and the Institute of Contemporary Art, donors and trustees who do not collect contemporary art contributed to the new contemporary galleries. "They are supporting us for civic reasons," says Ms. Medvedow. With the Museum of Fine Arts's new wing at the center, exposing people to contemporary art who would never, in the past, have gone to the Institute of Contemporary Art, Bostonians see a virtuous circle in play. 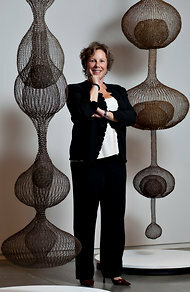 "It's a great Good Housekeeping seal of approval for contemporary art in Boston," says Ms. Medvedow. To the institute, there is no competition between the two: "They'll show artists we're not able to follow because we're on to the next thing," Mr. Corkin said. Occasionally, Boston's contemporary art boosters do wonder whether the public will turn out in big numbers for exhibitions, and whether tourists will come. Despite the fanfare, the Museum of Fine Arts has a small contemporary collection and lacks a must-see work. "We don't have key works by key artists, and we have gaps," Mr. Saywell concedes, though he has filled in some with loans. For now, he says, the museum is offering "juxtapositions, moments" rather than the full story of contemporary art. But, mostly, they are ebullient. "I don't worry that this won't be sustained," says Mr. Corkin. "There's too much momentum now for this to go in any other direction."